Simply sending one email to your target audience is very much a last century approach. Eloqua users have the ability to be much smarter than that and they have the ability to engage with people as they engage with them. The first step, before we explore the Eloqua Campaign Canvas, is to understand the objective of the campaign. 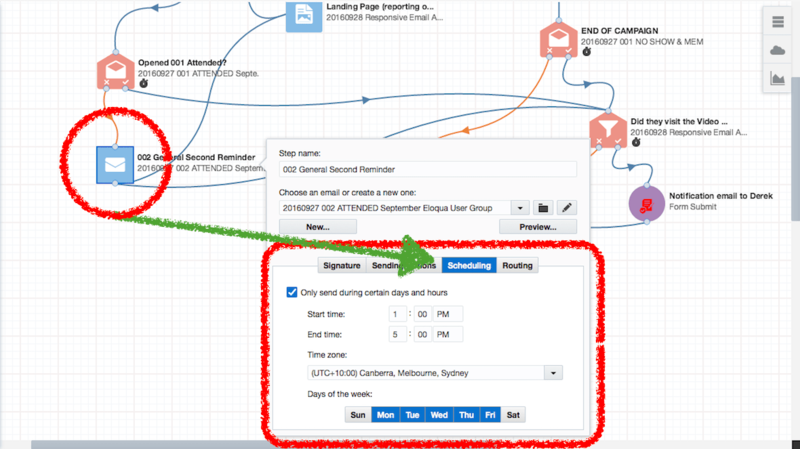 In the example below we’re sending follow-up notes to members of our Eloqua User Group. During last month’s meeting we covered a number of topics, one that we want to specifically measure interest in is our reponsive email template service. We have a video for people to watch that shows how an Eloqua user can build a responsive email in less than seven and a half minutes. We want to know who looked at that video. 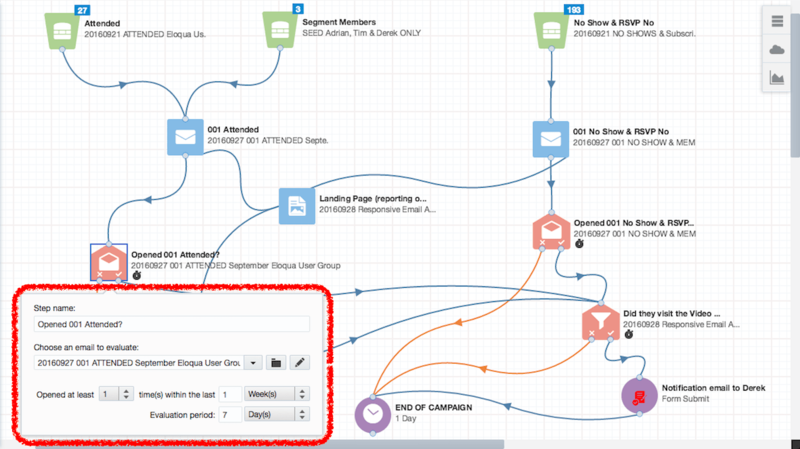 In the campaign canvas below you can see three segments, based on people’s attendance at the user group meeting. From there we send than a “it was great to see you” or “sorry we missed you” email. Part of being a member of the user group means you will always receive post meeting updates with notes, links etc that were covered in the meeting. 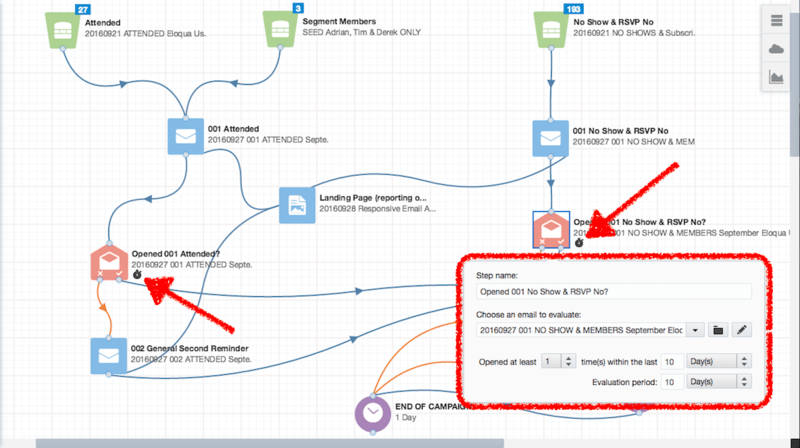 The seasoned Eloqua user will notice we’ve not used the usual “Wait” step following the email sends (red circles). Instead, we’re using the evaluation period based on activity for a period of time. The key objective was to see who clicked through to view the landing page that contains the video showcasing the HTML email templates. To capture that, we’ve used a Shared Filter (green circle) which asks the question has the contact visited a specific landing page within the past 10 days. If that’s a positive i.e. they visited the page, we’ve then added the Form Submit App to the canvas which will send a notification email, in this case to me. However, depending on your campaign, you could use form processing steps to push this directly into the CRM as Lead. As a contact enters the “Opened Email” Decision Step an evaluation of their Digital Body Language kicks off and repeats every 15 minutes. Every 15 minutes Eloqua will check to see if they meet the decision step criteria in the positive i.e. did they open the email? It will repeat this process for the duration of the evaluation period, in this example 7 days. As soon as the contact meets the decision step criteria in the positive, they move onto the next step. If, at the end of the evaluation period, they have not opened the email, they are routed based on the negative outcome. When you uses a “Wait” Decision step directly before an email send, you’re absolutley clear about the time of day and the date the email will be sent. However, when you use the Evaluation period option, you need to think through the email send time. Nothing says spam more than a personalised email sent at 2:36am on a Saturday. You avoid this by adjusting the “Scheduling” of the individual email. See below. 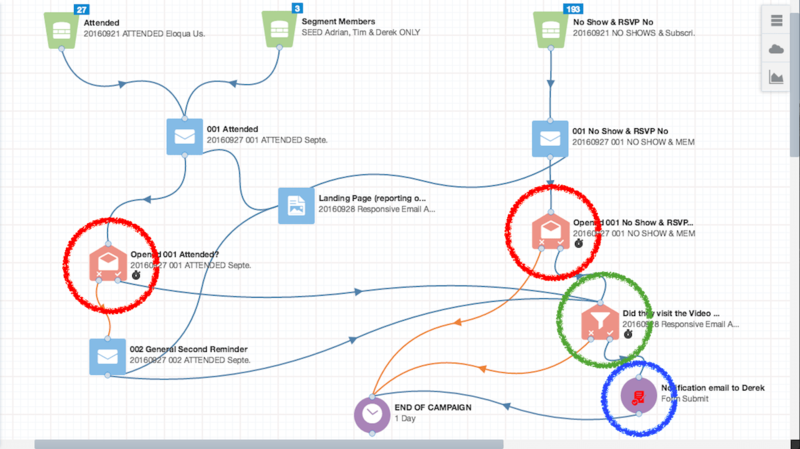 Once you’ve added an email to the Email Send step, it’s turns blue – see the red circle above. Double click on the email, the Ste window pops up. Then click on the “Scheduling” tab, highlighted with the green arrow. Now you can be specific about the time/s of the day and day/s of the week the email can be delivered. In the example above we’ve selected between 1:00pm – 5:00pm Monday through Friday. We’re a B2B organisation, so we choose not to email people outside of busines hours. Got questions? Click here to submit your query.